Leading Manufacturer of high intensity drum magnetic separator, drum magnetic separators, iron automatic magnetic separators, low intensity wet drum magnetic separators, over brand electro magnetic separator and electro drum magnetic separator from Chennai. 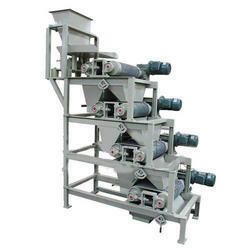 We are the leading manufacturer, supplier and exporter of High Intensity Drum Magnetic Separator. High Intensity Magnetic Drum Separators are manufactured of stainless steel and have cleats to aid in pulling tramp metal through and out of the magnetic field. Drum magnets are ideal for the continuous removal of tramp and fine ferrous contamination from dry bulk material used in the processing of foods chemicals minerals and any similar product type. 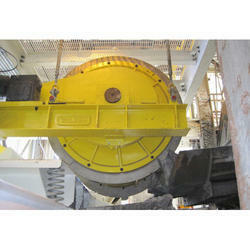 The drum should be fitted at the conveyor discharge or ideally direct below a vibratory feed system. High performance Rare Earth neodymium magnets are incorporated within a stainless steel wear resistance drum shell. The drum shell is supported on high quality sealed flange bearing to ensure smooth efficient and reliable rotation of the shell around the magnetic element. 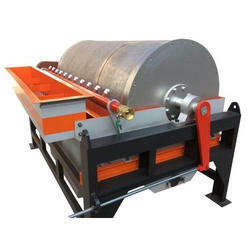 We are the leading manufacturer, supplier and exporter of Drum Magnetic Separators. Magnetic Drum Separators are manufactured of stainless steel and have cleats to aid in pulling tramp metal through and out of the magnetic field. High performance Rare Earth neodymium magnets are incorporated within a stainless steel wear resistance drum shell. The drum shell s supported on high quality sealed flange bearing to ensure smooth efficient and reliable rotation of the shell around the magnetic element. 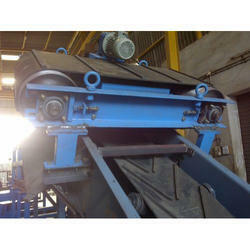 Iron Automatic Magnetic Separators are primarily designed and manufactured as low field intensity separators. They have an open magnetic system with the magnetic poles located in one plain. Low field intensity separators are employed for separating iron particles from bulk material whenever foreign iron disturbs the subsequent process sequences. We are the leading manufacturer, supplier of Low Intensity Wet Drum Magnetic Separators. Magnetic Drum Separators are manufactured of stainless steel and have cleats to aid in pulling tramp metal through and out of the magnetic field. High-performance Rare Earth neodymium magnets are incorporated within a stainless steel wear resistance drum shell. The drum shell s supported on high quality sealed flange bearing to ensure smooth efficient and reliable rotation of the shell around the magnetic element. 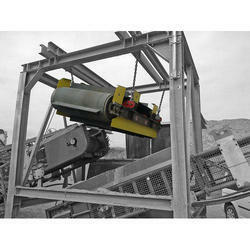 The Over Brand Electro Magnetic Separator is designed high performance electromagnetic system from an extensive range of designs to suit your application and provide the most effective and efficient method of metal recovery for suspension over a horizontal or incline conveyor, or over the head pulley. A deep electromagnetic field extracts tramp ferrous metal from the conveyor. This is then automatically removed by the heavy-duty rubber belt, and deposited into a skip or collection bin at the side of the conveyor. 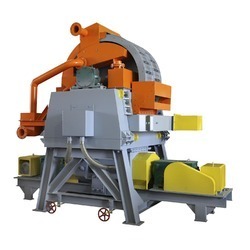 This type of separator is mainly used in the quarrying and recycling industries where high levels of contamination and non-stop conveyor processing require a self-cleaning electromagnet. 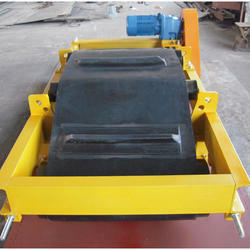 Used for metal recovery, our Electro Drum Magnetic Separator find optimum usage in mining, metallurgy and allied field. Customers can avail these high performance electromagnet systems from us in an extensive range of designs and at market leading prices. Designed to suit the specific application requirements of clients, our products are reckoned for providing the most effective solution in the field of metal recovery. 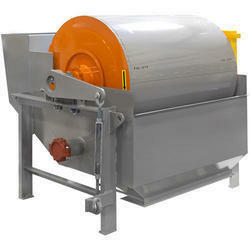 We offer a diverse range of Wet Drum Magnetic Separators. We are the leading manufacturer, supplier and exporters of the same. Our range is offered keeping in mind our clients’ varied requirements and they are extensively and effectively utilized in iron ore and dense media plants for removing ferrous substances. 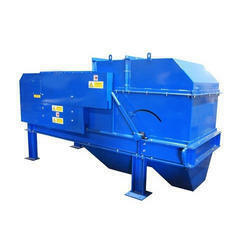 Our Wet Drum Magnetic Separator is fabricated from high quality rare earth magnet, which makes them effective and capable enough to attract fine and weak ferrous dusts and scraps from heaps of materials. 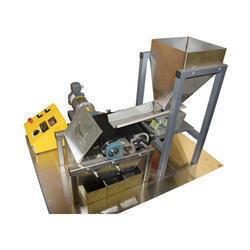 We are the leading manufacturer, supplier and exporter of permanent Roll Magnetic Separator. Induced magnetic roll separator , rare earth magnetic roll separator and high intensity magnetic roll separator new generation of magnetic roll separators, designed by emf, combines the latest technological achievements in magnetic concentration based on high-intensity, high grade, high power re- permanent magnets generate an exceptionally high magnetic gradient for the most cost-effective way to process weakly magnetic materials. Optimal separation of the material is achieved by custom design and any number of roll concentrator modules may be used to attain the required throughput or separation. Dry granules of the material are fed onto short conveyor belts of thin yet durable material passing over rolls of customized magnetic configuration. The non-magnetic particles fall freely off the end of the roll while the magnetic particles adhere momentarily to the roll and are discharged into a separate chute by means of an adjustable splitter below the belt. The modular nature of the emf enables any number of units to be stacked to achieve the required performance. Since the material is never in contact with the magnetic roll there is no wear on the magnets and under normal conditions magnetic strength is retained indefinitely. Iron Magnetic Separator are primarily designed and manufactured as low field intensity separators. They have an open magnetic system with the magnetic poles located in one plain. Low field intensity separators are employed for separating iron particles from bulk material whenever foreign iron disturbs the subsequent process sequences. High Intensity Roll Magnetic Separator is a roll type dry magnetic separator with a fixed magnet having high field intensity and gradient. The magnets used in the roll magnetic separators and made of alloys of rare earth elements are more powerful as compared to other magnets.